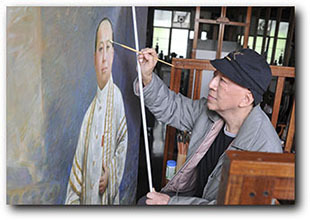 Born on 16th August 1943 in Bangkok, Thailand, son of Chub and Sawangchan Posayakrit, he completed his primary and secondary education at Vajiravudh College, then went on to the Faculty of Painting and Sculpture, Silpakorn University until his graduation. 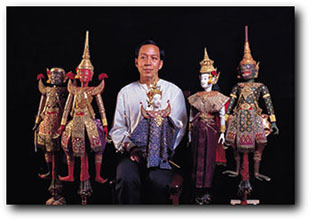 Chakrabhand Posayakrit was honoured with the title of National Artist in Visual Arts (Painting) in 2000 and was awarded a citation as �Master Craftsman during the 200 years of the founding of Rattanakosin,� one of 52 names cited. 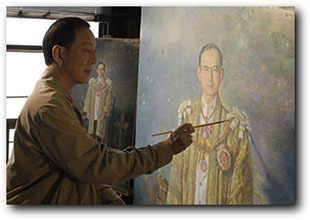 Chakrabhand gave lessons in painting to Princess Ubolratana and Princess Maha Chakri Sirindhorn when they were young. Currently, at his house on Ekamai Road, he has established a foundation in his name, which operates as a museum, office, workshop and puppet theatre. 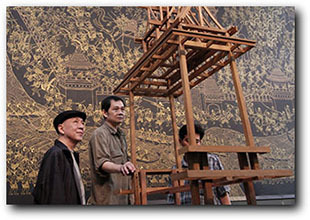 Chakrabhand is a free-lance artist of great expertise with a unique signature style in traditional Thai and contemporary art. 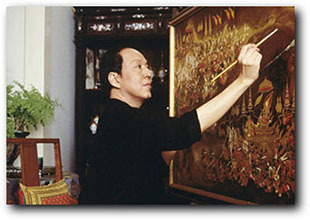 His other works include temple mural paintings at Wat Tri Thosathep and Wat Khao Sukim, sculptures of Chao Ngo and a buffalo boy from the story of Sangthong written by King Rama II at the King Rama II Memorial Park in Samut Songkram, and puppetry, such as the creation and production of The Three Kingdoms, the episode of The Battle of the Red Cliff and Taleng Phai, together with the restoration of the Vice-regal Puppets. Chakrabhand completed his secondary education at Vajiravudh College in 1961 and went on to Silpakorn University until his graduation in 1968 with a degree in Fine Arts (Painting). He has received honorary doctoral degrees in Fine Arts (Creative Arts) from Chulalongkorn University, in Applied Arts from Silpakorn University, in Painting from Silpakorn University and in Performing Arts from Ramkhamhaeng University.